I found myself doing something different this week. I privately reread many of the picture books I read to my children. The Dot, Ish, and Sky Color are all stories about children but they were relevant to me. I was inspired, reaffirmed, focused, challenged, comforted, convinced, and motivated as I read them. I even changed the names of the main characters to Eric and compared the situations in the books to my own life. I really didn't see this coming. I thought my children would learn everything this week. But, they weren't alone. I learned right along side them. Peter H. Reynolds has written and illustrated dozens of books for children. On the website for FableVision, the educational media company he founded, his bio reads, "While Peter H. Reynolds is indeed an artist and author, he would rather be known for his mission to use media to tell stories that matter and challenge us to reach our full potential." 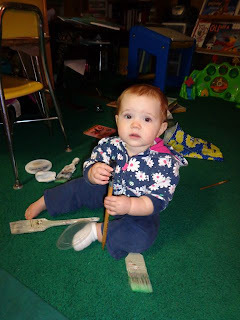 On TeacherVision he said, "I think I was born with a pencil in my hand and I never put it down." He and his twin brother Paul were making newspapers by 2nd grade. (Pippen Properties). Then, something huge happened in 7th grade. His teacher, Mr. Matson challenged him to apply his artistic talent to teach a math concept. (FableVision) Reynolds has been teaching through his books and other projects ever since. There wasn't just one book by Peter H. Reynolds that resonated with us this week. We started the week reading Sky Color, which is about Marisol, a young girl who is responsible for painting the sky for the library mural. 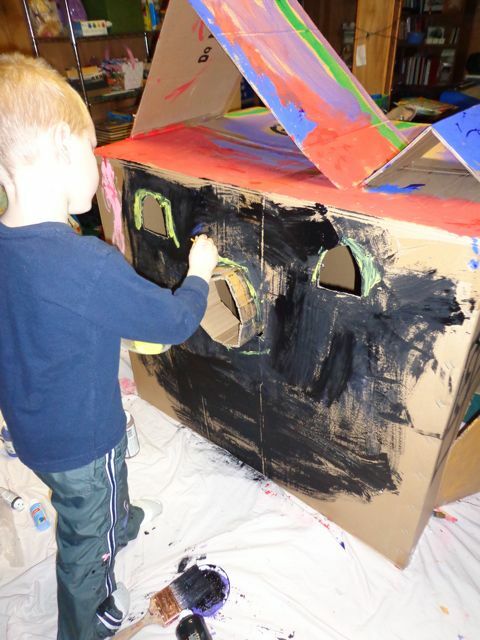 She is challenged to rethink how she sees the sky when the blue paint comes up missing. Then we read Ish, a story about boy named Ramon who loves to draw until his older brother laughs at one of his drawings. Encouaging words from Ramon's sister help him see his art in a new way. Another was The Dot, a story about Vashti whose art teacher encourages her to make her mark just to see where it leads. These three books are Peter H. Reynolds' Creatrilogy. In an interview on Bildungsroman he said the purpose of these books are to, "help children protect and nurture their creative flame which all to often is squelched or not developed." 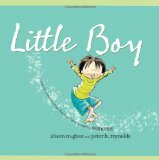 We also really enjoyed Little Boy by Alison McGhee. This book celebrates all the things that are special about being a little boy --jumping in puddles, lots of band-aids, special pajamas, and big cardboard boxes. We had a giant cardboard-box-house in our basement that was destined for the recycling bin. It went untouched for many months and its size was becoming a burden not to my children, but to me. 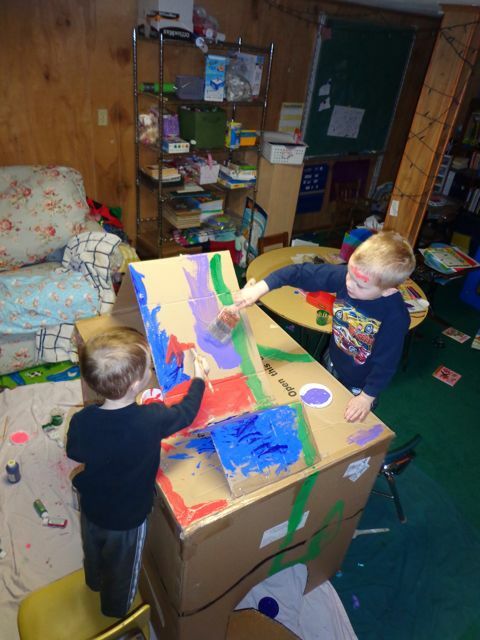 It seemed to be always in the way and made the room look cluttered. 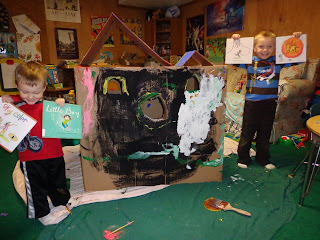 But after reading, Little Boy and the Creatrilogy, I started thinking about that cardboard-box-house and how it probably just needed my boys to "MAKE THEIR MARK" to give it new life. 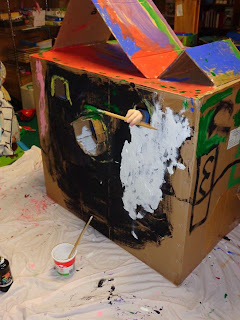 Our cardboard-box-house has been with us since October and untouched since January. It needed a new look. I told my two boys to just start painting and see what happens. My son said, "Should we make DOTS, like the book?" I said, "You can. Or you can make stripes or whatever you want." He said, "Maybe I will make a squiggle like that boy at the end of THE DOT." His squiggle quickly morphed into an alien. 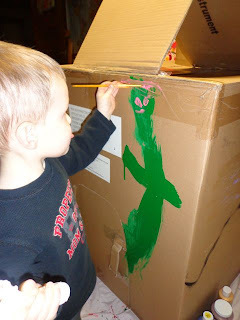 His younger brother loved the idea of aliens and began painting one of his own. The colors came out fast and furious. I couldn't keep up with all their requests! They loved standing on chairs to paint the top of the box. 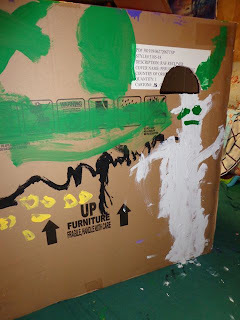 Many more details were added including the start of a white Frankenstein monster. My oldest son found the black paint which transitioned the "house" into a "cave". 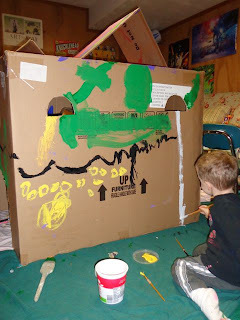 The next day the boys wanted to paint more of their cave. 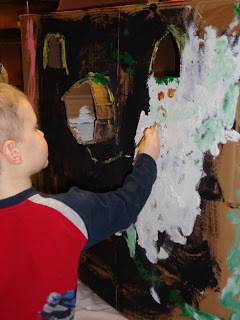 Here my youngest tries to paint his brother who is inside the cave. On the inside, multi-colored jewels were painted which made this a "Treasure Cave." 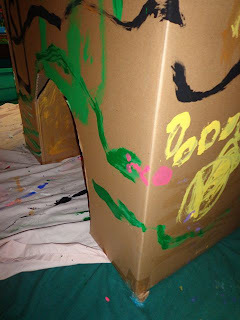 The monsters and aliens on the outside of the cave became the protectors of the jewels inside the cave. 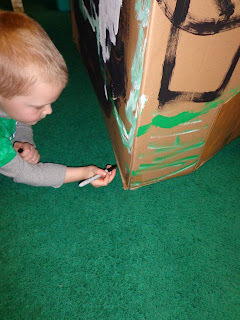 He said, "Hey, I'm painting upside down!" Watch out an wild painting arm is coming out of the cave! Fierce snakes with pink eyes and a tongue were added for additional security! 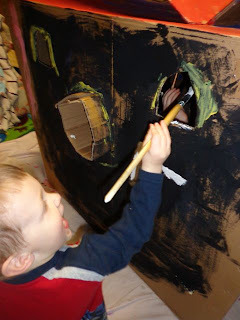 A mummy with golden eyes, nose, and mouth haunts this treasure cave! Thank you Peter H. Reynolds for writing books that inspired us to be confident and creative! 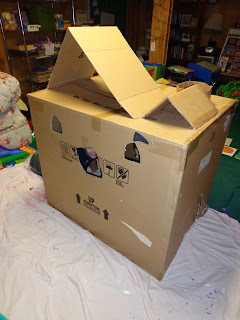 My children were able to turn a plain cardboard-box-house into a story. 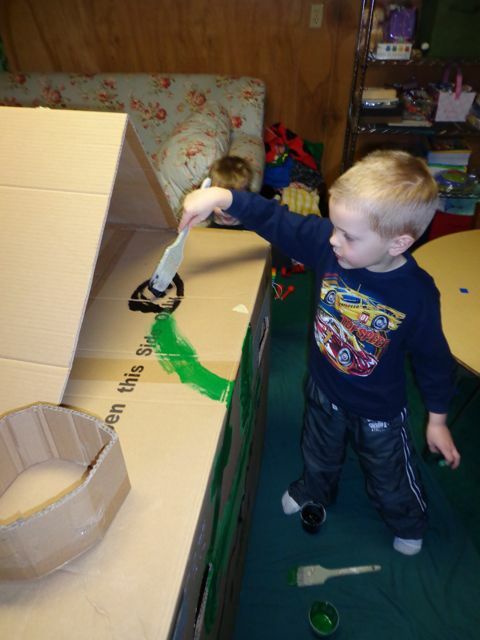 Daring us to "Make our mark" saved this box from the recycling bin! Yay, happy birthday Peter H. Reynolds. We love his books too, and it looks like your kids had a lot of fun celebrating! Thanks Hannah! They did a great job painting! 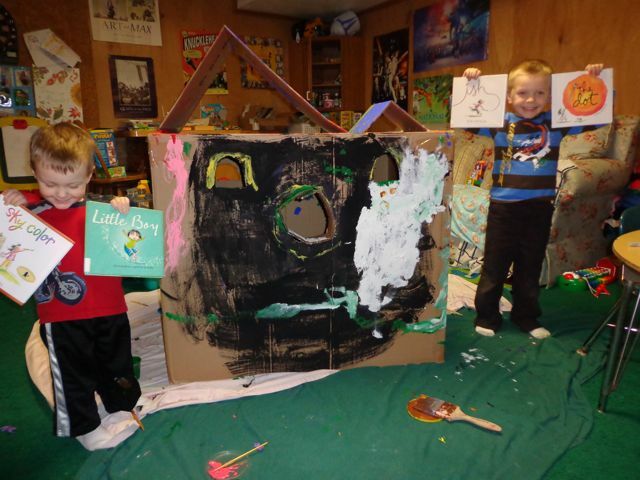 I think Peter Reynolds would be very proud of your boys' creation. ISH is a favorite of mine. And I can't wait to get a look at MUSEUM. Happy birthday, Peter. Thanks Joanna. I can't wait to get my hands on a copy of MUSEUM. It sounds great! Happy birthday, Peter! 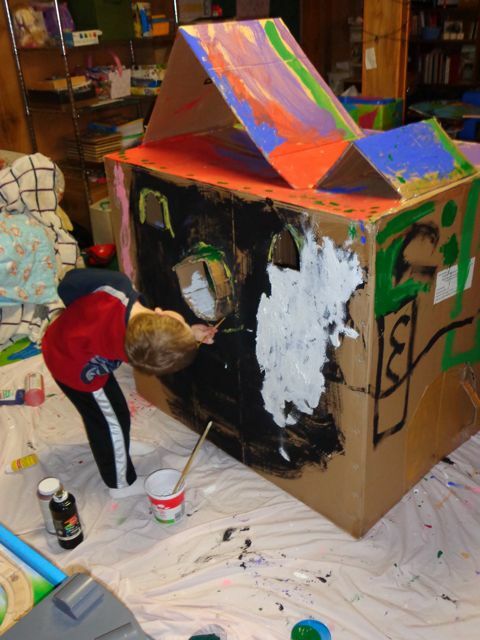 (and Paul) Love the transformation of the box house, and how its story grew wherever the paint took the boys. "Ish" and the rest of the Creatrilogy are so encouraging to me, as someone whose artistic leanings were squelched in school -- it took a wonderful mentor when I was in my teens to rekindle my willingness to express my own Ish-ish art. Thanks so much for the link to the interview -- I got my copy of The Museum a couple of days ago, and you're all going to love it! Thanks Beth! Thanks for sharing such a great interivew with Susan Verde!